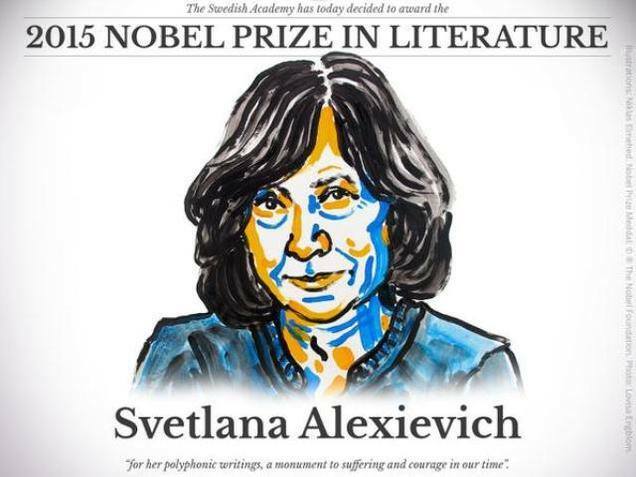 The Nobel Prize in Literature for 2015 is awarded to the Belarusian author Svetlana Alexievich. The Nobel was awarded “for her polyphonic writings, a monument to suffering and courage in our time”. 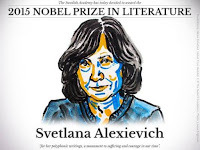 Ms. Alexievich is the 14th women Literature Laureate. Ms. Alexievich used the skills of a journalist to create literature chronicling the great tragedies of the Soviet Union and its collapse- World War II, the Soviet war in Afghanistan, the 1986 Chernobyl nuclear disaster and the suicides that ensued from the death of Communism. The academy’s permanent secretary, Sara Danius, told that Swedish broadcaster SVT that she reached the writer just before the announcement. “She said one word- ‘Fantastic!’” Danius said. She praised Alexievich as a great and innovative writer. “She transcends the format of journalism and has developed a new literary genre that bears her trademark,” Danius said.